Preheat oven to 375°. Beat Country Crock® Baking Sticks, granulated sugar, light brown sugar, eggs and vanilla in large bowl with electric mixer until creamy. Beat in flour, baking powder, salt and baking soda just until blended. Stir in half of the chopped milk chocolate until every spoonful of dough has some of the chocolate. Bake 9 to 10 minutes until edges are lightly golden. 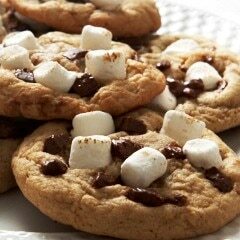 Immediately top cookies with remaining chocolate and marshmallows. Return to oven and bake just until chocolate starts to melt and marshmallows begin to soften, about 30 seconds. Tip: For inspiration for other delicious mix-ins, see our Make it Yours Cookie Recipe.